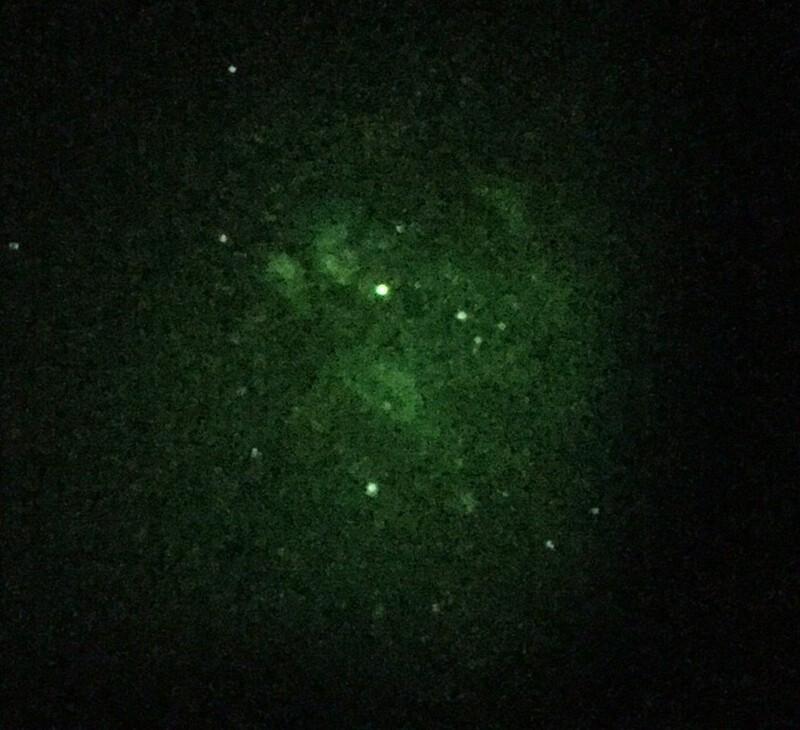 TL;DR: Had an amazing romp through the summer sky last night, am now wondering if I should get a smaller scope, and/or how to build up the perfect NV system for hand-held and tripod-mounted sky-scanning. I've only had my NV goggles for a month or two, and this weekend I'm at my in-laws' house about 40 minutes outside of town. Their skies are dark, but there is a high school and its giant football stadium adjacent to their property. Its lights and the HS parking lot lights are on all the time (yay, Texas! ), but I fortunately have some trees on the property to block most of them. 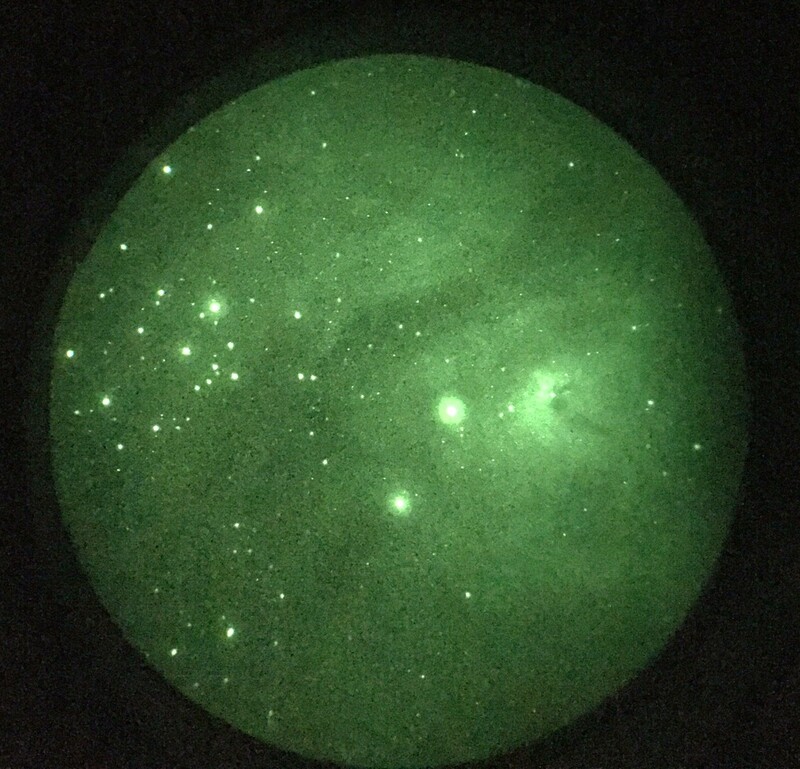 Last night I had an amazing experience with my night vision goggles, because I obtained the 3x objective, and because I had proper time to try out various filters. I bought the 680nm IR filter off ebay, which kinda fits inside the front of the 3x objective. I also had a Lumicon deep sky filter. And to really enhance nebulas, I have the Orion narrowband Ha filter. Last night, when I first scanned the sky with the PVS-7s, it was the normal lovely "sky full of stars" effect. However, when I hand-held the IR filter in front of the normal (1x) objective, I could immediately see the Milky Way, complete with dust bands, stretching from Sagittarius up through Cygnus and towards Cassiopeia. It was marvelous. The glare and glow from the nearby football stadium were practically gone. When I looked again without the filter, the entire sky looked "washed out", even though it was filled with so many twinkling stars. Next, I hand-held the Lumicon Deep Sky filter in front of the 1x objective, and it was just as effective as the ebay IR filter for cutting out light pollution, but the nebulae in Sagittarius popped a lot more. I could plainly see the Lagoon nebula and the whole string of nebulae near it. Next up, I used the 3X objective and the Lumicon filter to zoom in on these regions. Sadly, the 2" filter does not fit snugly inside the front, so it was a fairly sketchy proposition to hand-hold it. This is not hard to do, but it is one point of stress that distracts from the observing process. However, the views are well worth it. I just got lost studying the structure and texture around the center of the galaxy. Finally, I tried out the Orion H-a filter. Since this is a 1.25" filter, it just barely fits inside the front of the 1x objective of the PVS-7 unit. Once again, however, just as with the Lumicon in the 3x objective, this is not a "fit" in any real sense of the word, so I had to use one hand to gingerly hold the filter in place while viewing. But one look at the sky in amplified H-alpha changed my mind about modern visual astronomy. I visually observed the North America Nebula at 1x, and the entire region around Gamma Cygni was aglow. I saw the Garnet Star Nebula just hanging there. The string of nebulae stretching up through Sagittarius were like little puffy clouds in the sky. You couldn't not notice all of the stuff out there. No squinting required, no averted vision. I've never been able to see the skies like this. I remember being out at Island Pond, VT years and years ago, under exceptionally dark skies, and I couldn't see the Milky Way like the way I did last night, through football stadium skyglow. The upshot of all this is to say that I'm rethinking how I approach astronomy, given my current life parameters. I am extremely busy with work and the kids. I live inside a big town. The weather is fairly good in Texas, so there are quite a few nights of potentially good seeing. But getting out to non-totally-light-polluted-skies is a 20 minute affair at best. I'm wondering if I shouldn't downsize from the fork-mount C-11 to a fat, fast APO on an EQ. 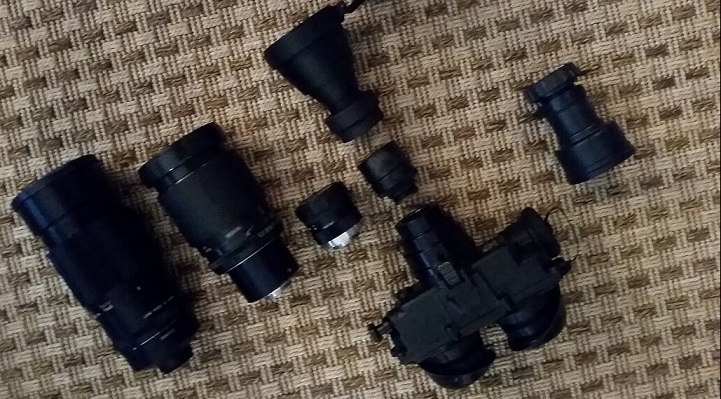 It would be a much more portable setup, and furthermore, I want to optimize for having WIDE views of the Milky Way that I can plug my Night Vision gear into. The C-11 EdgeHD is an amazing optical instrument and I've truly enjoyed my views through it, but it is a very bulky setup. Additionally, when I use my NV gear with it, it's too zoomed in; and for realtime video/EAA purposes, the f ratio is just too slow, without fiddling around with a bunch of reducer gear in the dark. So, I'm kind of interested in brainstorming about the "ideal setup" for NV-intensive astronomy. That is, I want to have sharp, unaided visual observation of clusters, planets, etc. But I want a setup that is easy and portable and fun to use for just sweeping the sky, looking at stuff. Honestly, I think if I had a filter wheel for the front of the PVS-7, a 1x-4x or 1x-5x zoom, and a tripod mount, that would basically be the ticket. If I also could get that in a high-quality APO that I could also use for realtime video, that would be the ultimate. Yes, for me, one of the greatest benefits of NV has been the incredible simplicty of being able to observe within about two minutes of making the decision to observe, and being able to see things that were previously behind a veil of light pollution. First, RAFCamera has a filter ring that converts from 1.25" filter thread to PVS-7 or ENVIS lens thread. Note.. I would order several of these, and don't do it though the web page. Contact Rafael and if you buy multiples, he will likely be willing to give you a discount. I don't remember if you had an ENVIS lens or not, but since you were using your PVS-7 in the C11 last month, I would guess you have a C mount adatper. The ENVIS lens screws in to the C mount and it lets you mount the 3x afcoal or go 1x without having to change the housing, and with the C mount and adapters, you can use SLR lenses for higher powers. This pic shows the Micro with one filter ring on it, but it also shows the 3x snap on conenctor with a filter mounted on it. Very easy to change from one filter to the other. As for Apo.. .Kind of wasted on NV in my opinion because even an Apo may show that the colors are not perfectly focused, and if this is the case, you need filters, and if you are going to use a filter, why not just use an achromat or an inexpensive 6" f/5 reflector and even better might be a simple Craigslist 8" dob. I myself have been thinking of picking up an 8" dob because while I love love love the Comet Catcher, the scale is very small and if I am going to carry out a mount to use a Barlow lens, I might as well carry out a small dob. SLR Lenses are fun to use, and I have found a couple of decent SLR lenses on Ebay for $20 to $40, and some very good zooms for $200. I have a Tamron 70mm to 200mm f/2.8 that is big and heavy, but it takes off where the 3x afocal leaves off. I am thrilled to hear that you have been playing with your PVS-7 more and getting some fitler adatpers and SLR lenses I think will give you the opportunity to do more low power viewing, which is very simple and a lot of fun! And here is a picturer of the PVS-7 with a variety of lenses. Warning.. Zooms do not produce the pinpoint stars you will get in the 3x afocal and a full aperture filter helps a lot. SLR lenses can be cheap though, and even a inexpenisve 70mm to 200mm zoom at f/4.5 can deliver some useful views. Lef to right you see a Vivitar 200mm f/3.5 that I think I paid $30 for (including shipping) from ebay. Next, you see a Tamron 35mm to 105mm f/2.8 zoom, I think this one was $125, and to be honest, is not that sharp, but improves with a full apeture filter and is a nice compromise with a bit higher magnfcation than the ENVIS, and a bit more than the 3x, but no need to change lenses. The small lens is a Computar 25mm f/1.3 that sells for $25 on Ebay. A great little fast focusing lens for general use (The ENVIS takes several turns to go form infinity to closest focus, while the CCTV lens does so with about half a turn.. For general NV around the yard I like the fast focus. The small black lens is the ENVIS. It is splined and threaded so uses the same stuff as the PVS-7 Mil Spec objective but as mentioned, it takes many turns to go from near to far, and frankly I have two PVS-7 and I then to use the one with Mils-spec Lens and 3x afocal far more than the one with C mount except of course when I want to use 200mm or telescope. That is what I use the C mount one for. Then of course is the 3x afocal shown ahead of the ENVIS, and finally the Mil-Spec objective. One of the really cool things about this gear is the flexibility. You get big field observing that is pretty much impossible to get any other way, binocular sized fields with SLR lenses, and you can turn a small reflector into something bigger, and still enjoy the convenience of the small scope. Edited by Eddgie, 03 July 2016 - 05:58 PM. 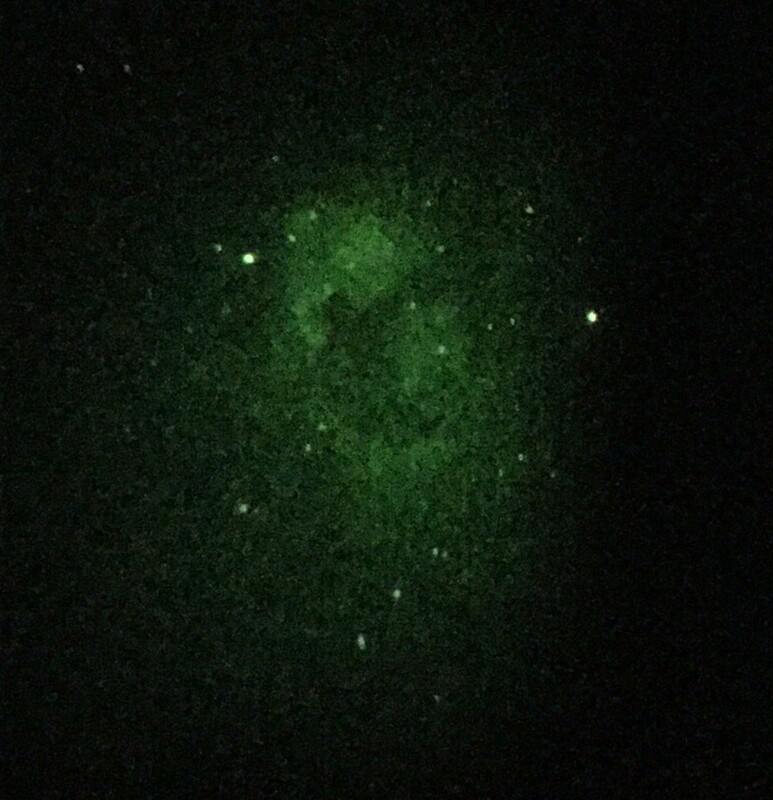 I can leave the 610nm filter on the front of the ENVIS and slip the snap on with the H-a filter over it to view Nebula. This won't give the sky contrast of the 685nm filter, but it makes it possible to go to H-a without changing filters. The best view will be with the H-a mounted directly. If I want to do just H-a, I mount the H-a filter to the ENVIS/PVS-7 objective, and then I just slip the 3x over it. 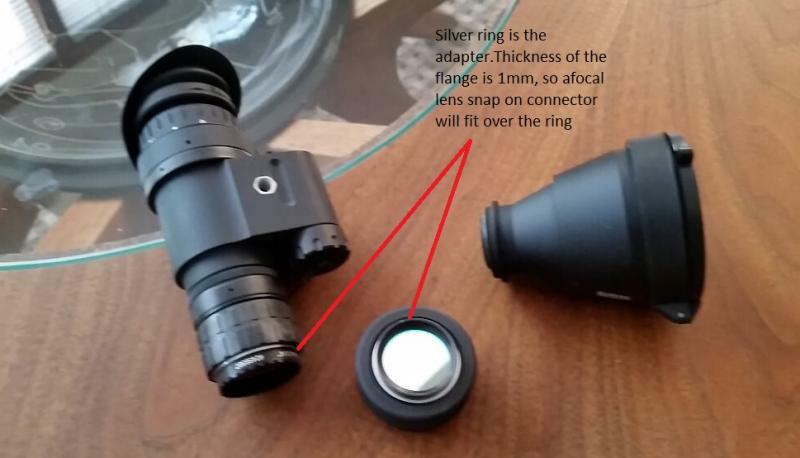 The 3x will not be able to snap into place, but it will engage the splines in the lens sufficently well to keep it aligned and the 3x is so light that I can simply wrap a finger around the bulge of the connector and hold it in place. This lets you go from 1x to 3x easily. You can just get an old color filter and remove the glass, then epoxy it inside the C mount to SLR adapter. Just make sure that you have room for the rear of the lens to still fit into the C mount adatper when the filter is in place. This makes it hard to change the filter though because again, it can be tedious to get into the adapter if you want to go from H-a to non-Ha but it works really well. Edited by Eddgie, 03 July 2016 - 06:06 PM. Thanks for all the info. I'm going to call up NVDepot today to get the ENVIS lens so I don't have to keep screwing/unscrewing the mil-spec objective assembly, and exposing the tube. This is one of the reasons I love the 3x afocal. Very light and snaps on and off. Last night I was out at Mansfield Dam and even at 3x I could easily resolve the pads in the Cat's Paw Nebula and the 12 degree field is fantastic for low power sweeping. I could even see M11 as granular at 3x. Wow, reading you guys talk about these NV goggles makes me want one so bad. So are they all that pricy or is there anything out there worth buying but a bit (let's say half) cheaper? My experience is that they're all going to be a bit pricey... Monocular vs binocular doesn't seem to affect the price much, since the bulk of the cost is in a high signal-to-noise ratio tube that is blemish-free. However, if you are not set on getting exactly one type vs another, it lets you expand your search net on the various locations for used gear (ebay, craigslist, etc.). Based on my experience, reputable eBay sellers will post pictures showing the screen so you can see if it will be acceptable for your usage. With white phosphor and thermal imaging now gaining popularity, maybe this will create more supply in the used market for the green gen-3 equipment. Based on what I've seen over the last few months, I really do think that ~$1500 is the lowest realistic price for these. A video reviewer on youtube indicates it has vignetting throughout almost the entire focal range :-( ... but that is a fast lens. I have not tried this lens, but my experience with zooms in general has been mixed. I love to be able to have a range of magnification, but as compared to the fixed focal length Computar or the 3x afocal, none of these zooms have been able to produce stars that are as sharp. This is the downside to night vision. If there is any unfocused glow, you are going to see it. I would say that fixed focal length lenses give sharper stars, but just like with a telescope, I would say that a lens that is sold as Apo or ED is going to do better than a lens with 7 or 8 elements. I do not though have any experience with the lens in question. I have a couple of Tamron Adatpall zooms I use.. One is 35mm to 105mm f/2.8 and the other is something like 80mm to 210mm f/2.8 and these work fairly well (though the big Tamron is heavy). I also have a f/4.5 Nikon zoom (70mm to 200mm) that actually does a pretty good job on stars and is a lot lighter than the Tamorn. I am sure that the longer focal ration simply improves the color focus in this lens. Not as good on nebula as the big Tamron though. This might be a silly question and the filter police might have me arrested for asking it, but asking anyway, can you attach the filter towards where you view from (e.g 1.25" HA filter on NVD with a canon lens)? If one can, the advantage would be not having to keep buying adapters (storing and keeping track of each adapter is getting difficult) for different lenses. Yes, that's absolutely what we're talking about. What Ed suggests above (but what I haven't done) is to epoxy a glass-less filter into the inside of the Cmount-to-EOS adapter as a thread, so I can screw in any 1.25" filter into it, on the back side of the lens. Yeah if we had to buy a full set of astro-quality filters for each lens front-diameter, that would get expensive fast! We wah we wah.... Putting filters close to the NVG is ok only if the camera lens has a long enough f ratio... Like 4+ (though see how you get on with others). Below f3 or so the pass band will shift and be different across the field of view and thus not be as good as normally specified. If you pop the filter in the back of the camera lens then you also add optical path length which will affect where the infinity focus position is. I use an "abbreviated" 80mm f4 "jumbo finder", I mount a 2" filter before a focal reducer, before the NVD to kept the filter fratio OK. Gives me more a more zoomed in view that 3x, but it is a bit weighty so I prefer to use it lying on the ground looking up.... Best area of the sky to look at as well. Ps buying 2" AND 1.25" filters gets expensive too. PPS "full set of Astro filters".... Huh, all we normally use is a deep red pass filter and a trusty narrowing hydrogen alpha filter.... Which others had you in mind?? A deep red SII filter would be interesting, but I wouldn't bother with hbeta or OIII.... NVG is not nearly as good at these wavelengths. That's true, IR and narrow H-a are the main ones. I found that the Lumicon provided different views than the vanilla IR filter. Most of the info above is accurate, but this statement "Monocular vs binocular doesn't seem to affect the price much" doesn't make sense with anything I've seen. Although prices vary, sometimes by double or triple, in all the night vision (NV) devices I've ever seen, monoculars (NVD Micro, PVS-14, etc.) are almost always more expensive than binoculars (PVS-7, not really binoculars, but that's another story). The only time I've seen a reasonable, to very good, price on a monocular was on Eddgie's NVD Micro Ultra. Looking through ebay, in just the last few minutes, the only monoculars near $2000 were not something you'd probably buy for astronomy. They were either lower grade Gen 2, without enough information, or they had enough info, but it was negative for astronomy, bad blemishes or other not up to snuff astronomical info. After that, the prices rose to $3K, and beyond, rather quickly. Just wanted to point out, in general, that monocular prices have always been higher than PVS-7 prices - not going to go into why. But I will say this, a device like the NVD Micro Ult, is typically noticeably better than the average PVS-7, but a PVS-7 gives you two-eyed viewing. Also, the idea that the money is in the tube, 1000% correct in terms of first you must consider the tube, above all, for what we're talking about. The image intensifier tubes have to be carefully considered for astronomy. In other words, if you can't get good info on the tube, it might not be a safe purchase. On the other hand, if the seller has an excellent reputation and a money back guarantee, then even without the info you'd like, a purchase like that still might be worth a try. Can't over emphasize tube considerations. Now for some bad news, very unscientific, but it is what I've seen over the last few months, prices on PVS-7s seem to be trending upward. There are still good deals to be had, but you really have to know what you're looking for and at. I just looked through ebay, very small sample looking through a few hundred items on ebay, and saw no good deals on monoculars, and out of a 172 pvs 7 items, I saw maybe two that I'd go for, and they might be priced out by subsequent bidding. One tube I looked at, asking $900, maybe an OK tube for NV, but not for NV astronomy. The blems were probably too much and in the wrong spots for astronomy. I've bought much better tubes for the same price to about half the price. It's still not all that easy to figure out and buy an NV device for astronomy. It's a major Catch-22, if you know what you're looking at and can purchase with confidence it means you probably already own an NV device. If you don't already own one and have a good understanding of it then it can be quite intimidating. Always use a credit card, paypal, buy from a reputable source. On ebay, you don't always have to buy from someone who offers a money back guarantee, but it helps, because ebay has their own guarantee process even if the seller doesn't. Apologies for detracting any at all from the title of this thread, "Night Vision changes everything". 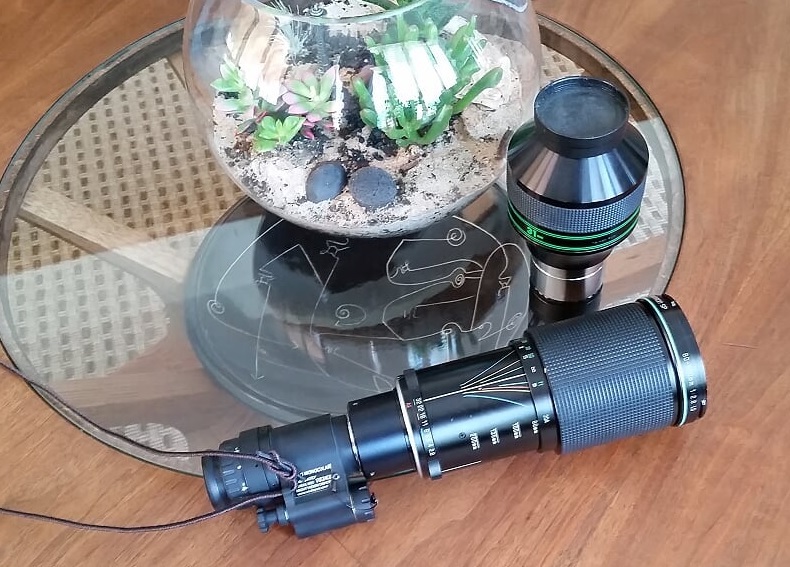 You can use these NV devices by themselves, no magnification at all, and they can be quite mind blowing, or you can think of them as highly advanced eyepieces and put them in a telescope and magnify the fun, either way, Night Vision changes everything! Astronomically and terrestrially, I don't really know about "everything", but they are a definite hit. My PVS-7s are #1 on the charts for about 35 weeks running. Edited by outofsight, 07 July 2016 - 03:25 PM. Putting filters close to the NVG is ok only if the camera lens has a long enough f ratio.. I am in now way suggesting that what you are saying is not true, only that while there may be a shift, it may be more than compensated for by the speed of the lens. I absolutely get better nebula views with the 210nm f/2.8 than with the 200mm f/4.5 when both are used with the 12nm H-a filter behind the lens. With the same filter, nebula are brighter and stand out better when I use the 210nm f/2.8. Pretty much everything is better in the f.2.8. The Nikon 70-200 f/4.5 is very light and I use from time to time, but the 2.8 Tamron does much better on Nebula. Likewise, I have a Vivitar 200mm f/3.5 and once again, I think the Tamron zoom at f/2.8 with the H-a filter gives nebula performance. I am not an engineer and do not know how serious the shift would be, but for me, it has not been bad enough to prevent me from still getting better nebula views with the faster zooms. Also, it could be that as the band pass gets narrower, the situation would get worse. So a shift in the force there may be, but balance this the fast lens Midi-chlorians must do. Edited by Eddgie, 07 July 2016 - 03:41 PM. I borrowed an SII filter , it didn't do anything, just very dim. Interesting.... The universe is mostly hydrogen, so that would tally. Would be interesting to see if the nebulae sty visible was from different bits of the nebulae. As always.... Give is go... If it works then great! The band should broaden and shift (think bluer, but that's from a long ago memory). Yeah, if you do any narrowband imaging you quickly learn that there isn't much SII out there. It's very faint and mostly found in shock fronts. I had to get up really early to head out to work, so I was out at 3:30 AM today with my PVS 7 at 1x with a 610 filter. I live in a heavily light polluted city and I was dumbstruck that I turned it on and looked up and immediately saw the Andromeda Galaxy!!! That blew my mind. I know that it can be easily visible at a dark site, but in the city you need magnification of some sort. I am standing at 1x and looking at a galaxy.....remarkable. LOL.. See, when I would tell people on the Equipment Forum that I could literally do astronomy while taking out the garbage, I was not kidding, and now you are totally starting to get it. This has been for me the most cherished attribute of using Night Vision. The ease as which you can convert short moments in darkness into an astronomy session has to be experienced first hand and once you experience it, you start to really exploit it. And I don't mean just because you can observe more easily either. What happened to me was that because it was easy, I started to see more and more structure and nuance in the sky than I could with traditional scopes. Often there are super big aggregations of stars that while we know are not true clusters are still in themselves quite beautiful to see in the same low power field. And seeing many nebula (mostly that can't be seen with small telescopes anyway) you realize that the sky is full of giant nebula and this gives you a very different persective of the thing conventional astronomer call "The sky". All around us there are gas clouds that could story our solar system edge to edge many times over. And if you think the sky is good with 610nm, try a 680nm. And if you think the sky is better with the 680nm, drive to the closest Mag 4.5 skies you can find and look again. I would say that I now do 80% of my observing with just the 1x and 3x. Another 15% is with the Comet Catcher. Even at 18x, M22 is stunning! 5% With the dob. Oh, it should be more, but these others are so easy to do, and there is soooooo much to see!!!! Edited by Eddgie, 11 July 2016 - 11:03 AM. And this. What really kept me from going to darker skies more was the effort required. Putting a C14 and CGE mount or 12" dob in a car, taking them out, setting them up, taking them apart, repacking them, then unpacking them again on the back side meant that this kind of thing had to be planned and sufficent time had to be avialable. With the NV gear, I can on the spur of the moment get in the car and drive to Mag 4.5 skies 23minutes away, observe for 45 minutes, see more than I could see in a 2 hour session using traditonal gear, and drive home again, all in the time it would take me to pack, drive, unpack, setup, un-setup repack drive home, and unpack. No collimation, no dark adaptation, no observer's chair (though I have taken a lawn chair so i could lean back!!!) no power supplies or cords for dew controllers.. The trip now is so easy that I have been to my local (not so dark) dark sky site more in the last year than in the previous 5 years before that. At the risk of sounding like a broken record, NV is the greatest thing that has happened to me in my 24 years of observing. As Eddgie said, quick walks outside at night include taking my PVS-7 with me. Sometimes I take the 12nm filter, sometimes the 610nm filter, sometimes the 3x magnifier and 680nm filter, but I am always wowed by what I see no matter which combination I take with me. Back in the day I must have gone through 10 "grab and go" setups, from 80-102mm refractors, to 5, 6 and 8" SCTs and Maks on alt/az mounts, as I was always looking for that quick look telescope. All of them took more effort than was enjoyable, and none were suitable for quick 10-30 minute sessions. Since getting into NV I find that I am willing to do 10-15 minute sessions, though most end up being a bit more just because there is so much to see with NV. I would say that 90% of my observing time is now done with NV. In fact, I haven't set up my dob since March. After reading all of Eddgie's comments about the Comet Catcher, I may just have to find myself a used one, or look at some of the small, fast reflectors available.